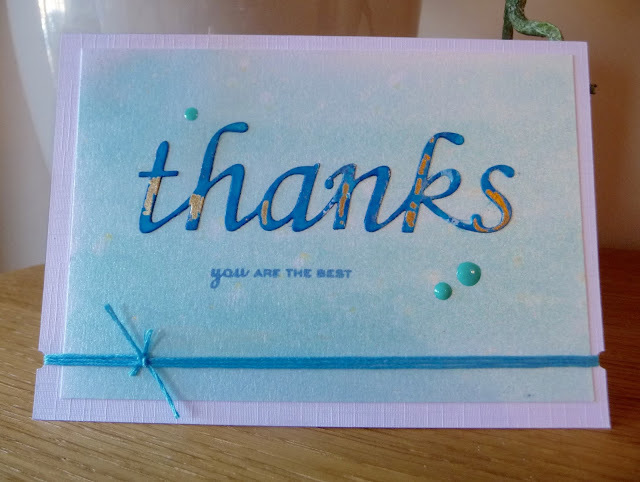 I was playing round with spritzing inks but couldn't get the look I wanted with this card. After I'd stuck everything down I figured out it wasn't the inking that was at fault it was the proportions - I'd put the sentiment too high up the card. The thread was then added as an after-thought to try and re-balance it all. Anyway, the sentiment die is by Memory Box and the faux enamel dots were made with Nuvo crystal drops. Stamp is by Personal Impressions.